An abdominoplasty is a surgical procedure that is designed to flatten the abdomen and tighten the muscles of the abdominal wall. It involves removal of excess fat and skin from the abdomen thereby restoring a flatter and tighter contour to the tummy. 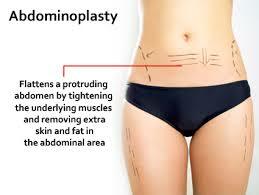 There are many indications for an abdominoplasty which can be reconstructive or cosmetic or both. The procedure is done in hospital and usually involves a stay in hospital of between one and three days. The procedure is done under a general anaesthetic administered by a specialist anaesthetist. You will be required to wear a special garment for several weeks afterwards to aid with healing and contouring of the abdomen.